Sculptor and draughtswoman Ghisha Koenig was born in London in 1921, the daughter of the writer and art critic Leo Koenig, who was one of Ben Uri’s founders. In 1939 she won a scholarship to the Hornsey School of Art, leaving in 1942 to begin four years of war service in the Army. Afterwards she studied under Henry Moore at Chelsea School of Art (1946-48) and at the Slade School of Fine Art (1948-49). She created small scale realist bronzes and terracottas in high relief, staining the latter ‘with dark ink prior to burnishing them to restore the clay’s richness’ (David Buckman). She was concerned with the human condition and much of her work focused on factory workers, whom she observed over 40 years, commenting that ‘after Hitler, the dignity of man had to be re-established’. Although observing them with dignity and endowing them with individuality, she nonetheless maintained a personal detachment from her subjects. She had a solo exhibition at the Grosvenor Gallery, London (1966), the Serpentine Gallery (and tour, 1986), and most recently, Henry Moore Institute, Leeds (2017); a memorial show was held at the Boundary Gallery, London in 1994. She also participated in a number of mixed exhibitions including ‘Jewish Artists in England’, Whitechapel Art Gallery (1956), also showing with the Artists’ International Association (AIA) and at the Sculptural Biennale, among others. Her work is held in collections including Tate, Manchester, Sheffield and the Henry Moore Institute, Leeds (the last also holds her sketchbooks and press cuttings in the HMI archives). 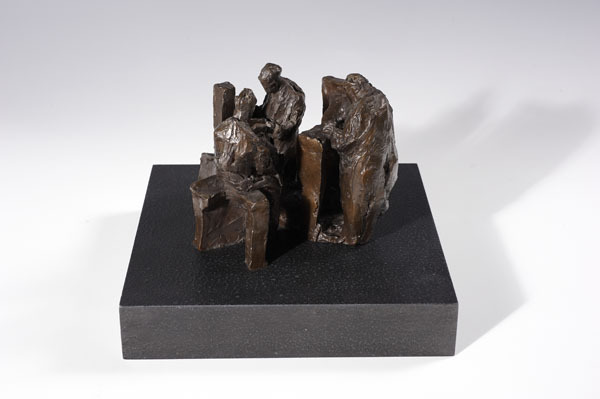 Ghisha Koenig's compositors (type-setters) is typical of her small-scale reliefs from the 1950s onwards, in which she sought to capture the relationship between man and machine, while maintaining the individuality and dignity of her subjects, whom she observed at first-hand in factory conditions over a period of more than 40 years. Toby Treves has commented that 'she might properly be considered as a semi-detached member of Britain's small group of postwar political social realists'.